What do the following have in common? A master butcher who once trained greyhounds, someone who once sold ladies' underwear on Devizes market and a soldier who lost a leg in the Korean War in 1952? The answer is that all three trained the winner of the Cheltenham Gold Cup. 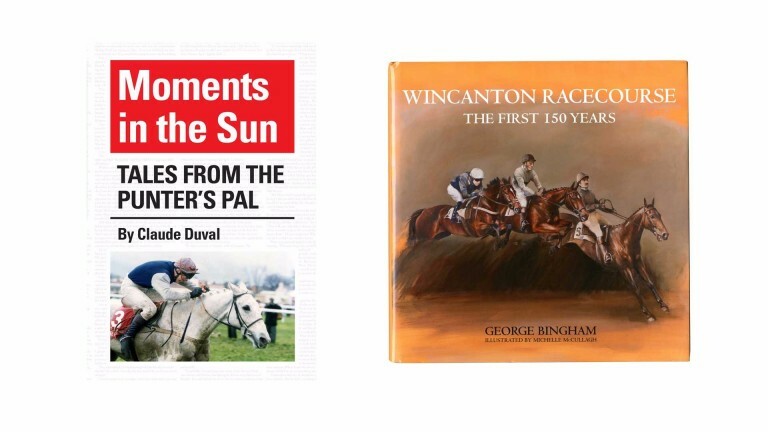 Such revelations are all contained in this memoir, which is not so much about the author – the Sun's longstanding racing correspondent Claude Duval, who retired in 2016 after 47 years – but about the men, women and horses with whom he dealt during nearly half a century in journalism. With most of the chapters updated specially for the book, it has a fresh, crisp feel to it and makes fascinating reading, though perhaps you need to be a year or two older than 40 to remember many of the former Punter's Pal's featured subjects. It is often hilarious, right from the first chapter that recalls the tragicomic story of Blackwater Bridge and the 1982 Grand National. The race was sponsored by the Sun, and Duval's brief from his notoriously mercurial editor Kelvin MacKenzie was to buy a horse to win the race. The paper then held a telephone competition so that one of the paper's readers would own the horse for the day. Blackwater Bridge, affectionately known as 'Blackie', was the horse duly acquired. Let's just say things didn't go as planned, despite the horse being sent to Aintree king Ginger McCain. McKenzie's final words on the subject to the hapless Duval? "Save a bullet for your f***ing self!" By then, Duval was an integral part of the paper's racing team and managed to keep the job he had begun in 1969, soon after joining the newly launched paper as a sports sub-editor seemingly on account of his ability as an off-break bowler. The young Duval quickly realised there was an opening for a writer and his sports editor, bored of his continually putting himself forward, told him: "Get an interview with someone who has never been interviewed before and the job is yours." Duval chose controversial trainer Captain Ryan Price, who didn't suffer fools at all, had the reputation of having the bark of a rottweiler and was adept at laying horses out for big races, in particular one race, the Schweppes Gold Trophy, the forerunner to the Betfair Hurdle at Newbury. It was a masterful choice. The account of his interview is pure gold, for Price really opened up to the young reporter, though it was clear Duval didn't believe that the Captain never bet. "Many years ago I borrowed £2,000," Duval quotes Price as saying. "I put the lot on a horse of mine at Wincanton which won at 7-2. I was at Doncaster and after I heard the result I put the lot on a Flat horse of mine which was pipped in a photo-finish. I then discovered that the horse at Wincanton had been disqualified and placed second. I learned my lesson." That sets the seal for the book for it is full of fascinating accounts about interesting people, including the former butcher, greyhound trainer and inveterate gambler Mick O'Toole, one-time underwear salesman David Elsworth and the one-legged war veteran Fergie Sutherland. Add to the mix chapters about the Irish farmer Tom Foley, the great Yorkshire trainer-farmer Peter Easterby, bookmaker Barry Dennis, and opposites Jenny Pitman and Martin Pipe and you have the recipe for a highly readable and entertaining book. Although by no means cheap at £25, this hardback celebrating the 150th anniversary of racing at Wincanton is a bit of a must for West Country racing fans and, given that it features a multitude of jumping greats, will also be attractive to those from further afield. A largely pictorial history of Wincanton stretching back to the racecourse's opening meeting in 1867, this is the first book by Dorset-based equine sculptor George Bingham with various images and illustrations by acclaimed local artist Michelle McCullagh. It is basically a trip down memory lane lovingly put together in 60 pages and kicking off with forewords by the author, racecourse chairwoman Jo Hepburn and ten-time champion trainer Paul Nicholls, whose Manor Farm stables are only a few miles away from the track. Any number of equine luminaries have graced Wincanton over the years, among them Champion Hurdle winners such as Persian War, Lanzarote, Bula, Alderbrook and Kribensis – plus locally trained pair Rooster Booster and Rock On Ruby – and chasing legends Golden Miller, Desert Orchid, Denman, See More Business and Burrough Hill Lad. On August 1, 1867, Wincanton staged its inaugural race meeting at Hatherleigh Farm before changing address in 1925 and switching to its current home at Kingwell Farm, high on a hill north of the Somerset town. "Though the styles and shapes of the jockeys have changed and the fences are perhaps less demanding, the sport remains the same to this day," suggests Nicholls in his introduction. And that, in essence, perfectly sums up the Wincanton on show in the pages of this nicely packaged effort – the course has maintained much of its rustic charm down the years, yet has managed to move with the times in many other respects.